Ever dreamed of seeing the fiery beauty of Spain with your own eyes? Or setting sail to the home of the world's greatest explorers - Portugal? Or of walking down the ancient and mysterious medinas of Morocco? We think it’s time to stop choosing between the three and put together a mesmerizing tour to Spain, Portugal and Morocco, full of sunshine and unforgettable discoveries. The enchanting kaleidoscope of colors exploration begins in one of the world’s most temperamental destinations - Spain’s Barcelona. The Catalan capital is full of brilliance that can be traced in its exquisite architecture, historic old town, enlightening nature and explicit art. The sunny city shines with pride for many reasons, for one it was gifted the legacy of Antoni Gaudi’s creations. The one that defines Barcelona is his project of a lifetime - the yet unfinished Sagrada Familia basilica with so much resemblance to a sand castle. 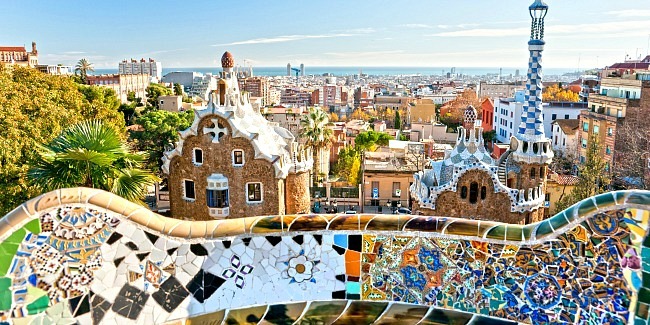 The splendor of Gaudi’s famous Park Guell is incomparable too, with the mosaic salamander, the iconic symbol of the city being its heart, teamed with the curvy multi-colored pieced seating, the “gingerbread” houses and python walkways, made as if of candle drops. The glimmering nucleus of Spain has a special vibe of its own. Madrid boasts imposing royal palaces, broad plazas and lavish parks. Its epicenter of Spanish art, the Prado Museum, houses the fruitful wealth of masterpieces created by the county’s greatest masters. Right by Madrid’s side stands the former capital, Toledo, displaying its bygone eminence and tempting to get lost amidst its petite ancient paved roads. The land of great discoverers can undoubtedly inspire just about anyone to setting off on an exploration of their own. Having given Vasco da Gama, Ferdinand Magellan and Christopher Columbus to the world, diverse and alluring Portugal has much to share with travelers. As such is the architecture of Lisbon with its rosy roofs and colorful walls, scintillating vivaciously in the sunlight and overlooking the Atlantic Ocean. The walls, coupled with the age-old white cobblestone streets and old wineries, delicately hiding best Portuguese wines, encompass much history and stories. The capital’s vintage yellow trams slide like rays of sunshine about the hilly city, inviting to take a ride around Lisbon’s main sights and treating to exciting views and steep climbs. The fairy-tale world of castles - Sintra and Cascais encircles with beauty, magic and fantasy. The Pena National Palace bursts with colors and is the dreamy result of the creative power of imagination standing atop a high hill. There are many other extravagant palaces, picturesque parks, luxurious villas and centuries-old forts here, which are just as heart-stirring as the westernmost point of the continent itself - the edge of Europe called Cabo da Roca. Right on the other side of the Gibraltar that separates Africa and Europe is charming Morocco. This land has always been an inspiration, luring travelers with its well-preserved labyrinth medinas, long-standing buildings, eternal traditions; mesmerizing with its endless apricot-colored sand dunes with retreating camel caravans that seem to have forever been traversing the vast expanses of Sahara to the desert’s time-stopping rhythm. Morocco’s cities are somewhat divergent yet obtain spellbinding traits - medieval medinas that are made up by maze-like streets, sometimes wide enough to fit just one. The streets of Fes are so intriguingly reminiscent of one another, tangled and busy, perpetuating life as it was many centuries ago. The traditional souk markets of Marrakesh, brightly colored crafts, extraordinary leather tanneries and astringent smells of spices all give the chance of travelling back in time, in a sense providing guests with a Moroccan version of Alice in Wonderland. Where to Travel in Morocco?